Vroooom Vroooooom …. I was coming through Chakli Circle (Birds Circle) to my office from BSNL office in my bike. Went straight till the circle and took right to Jetalpur road. There were many vehicles including bikes and cars were in the same mission that is, to cross the never-ending traffic coming from all directions. But in couple of seconds I crossed the road unhurt and happy. Nobody was unhappy, nobody was hurt. Not only me but every other vehicle crossed the road in no time. I have pasted a drawing below to give you an idea about the complexity I am talking about. I was trying to go from D to C. I must thank Hiya for allowing me to use her drawing sheet and crayons. This amazed me. I stopped and looked back to understand, how is it possible? I tried to recall my moves. While crossing the road I tried to move forward when got some space in front of me. If I am late in making the first move then person from another direction made the move. So, there was a competition. You first or I first. But nobody was bothered when they are loosing. They are attempting again and again till they succeed. Everybody is focused on how to go forward when they have an opportunity. They all know what is their goal and how to reach there. Nobody is talking to each other. Everybody’s focus is on their vehicles front part to make sure their direction is right. Vehicles are communicating with each other either through honking or by their movement. This world is like this chakli circle.There are so many people you meet throughout your journey called life. Everybody has their goal and priorities. Everybody has their own belief about ideal way of life. So we cross each others road in many occasions. Ultimately everybody wants their journey to be smooth and reach their desired destination. But here we do not follow the same rules that are followed in Chakli circle. We do compete with each other to prove we are best but we stay longer worrying about failures than preparation for second attempt. We question others belief on way of life but in chakli circle we find our way and then move forward in our way. In life we communicate more to express our emotions rather than our intentions where in chakli circle we communicate only our intentions. I know chakli circle is chaotic but life is no less chaotic. I know chakli circle has more than one traffic polices which adds to the chaos but this world also has thousands of traffic polices to show our ideal way of life. 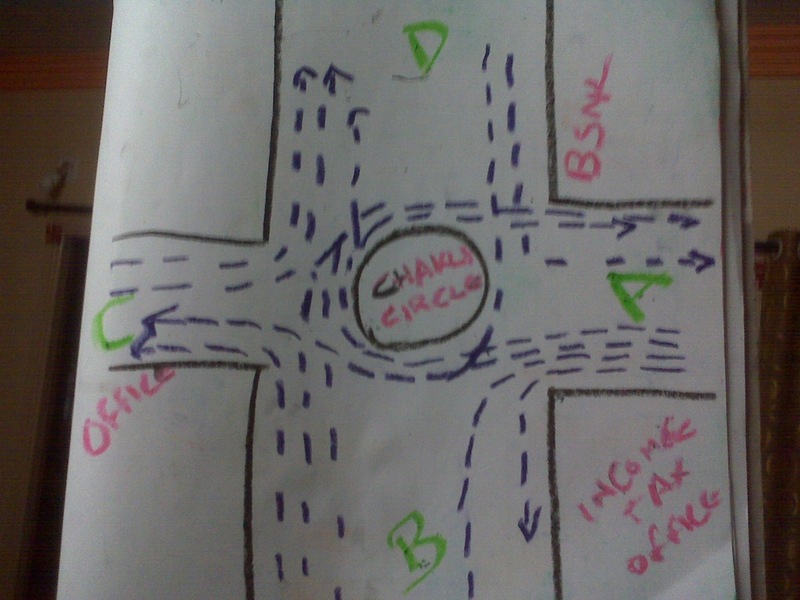 But it was easy to cross chakli circle without any clash. Yes but what about the drivers who are riding the vehicles. Although I really like this post, I think there was an punctuational error close towards the finish from the third section. Previous PostPrevious How I became spammer?